TOKYO, Jan 28, 2019 - (JCN Newswire) - Mitsubishi Heavy Industries Engine & Turbocharger, Ltd. (MHIET), a Group member of Mitsubishi Heavy Industries, Ltd. (MHI), is to undertake major expansion of its product lineup made and sold through Shanghai MHI Engine Co., Ltd. (SME), its joint venture with a local manufacturer and marketer of diesel engines based in Shanghai, China. The move is aimed at developing diverse market demand in China now that, after six years in operation, SME has acquired solid brand recognition and built up corporate strength. As the first step, SME has newly launched the "S16R2-PTAW-C," a powerful 2,000-kilowatt (kW) model in the SR Series of diesel engines used in power generation applications. The new offering will stimulate demand for a diverse range of distributed and stand-alone power generation systems. SME was established in March 2013 in alliance with Shanghai Diesel Engine Co., Ltd. (SDEC), an affiliate of Shanghai Automotive Industry Corporation (SAIC) and one of China's leading producers of diesel engines. SME's head office and factory are located within SDEC's premises in northeast Shanghai. 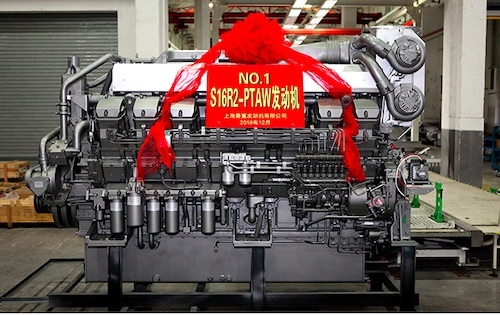 Since its founding, the JV has manufactured and sold engines licensed by MHIET for the local Chinese market. The S16R2-PTAW-C engine newly added to SME's lineup delivers an output of 2,167kW (mechanical), topping the previously available eight models which have featured outputs in the 635kW to 1,895kW range. Recently, models in this range are seeing rapidly expanding demand as emergency power sources for use in data centers, hospitals and residences. 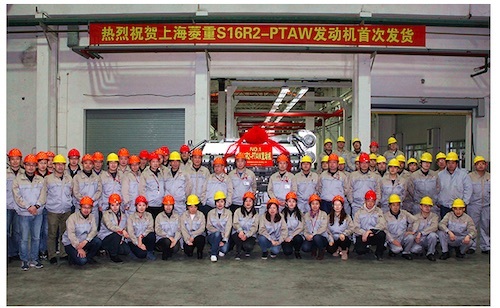 The S16R2-PTAW-C has already attracted orders from some leading Chinese companies dealing in power generation sets, and shipment of the first unit has been completed. Engines manufactured by SME will be sold to genset manufacturers. Here, generators, radiators and other equipment will be incorporated for supply to the market as gensets. By furnishing Japanese technological prowess to SME's local manufacturing plant, the partnership will simultaneously achieve a Japanese level of high reliability and outstanding cost-performance enabled by Chinese production, to drive the local market going forward.